If residents don’t cough up more money to pay Paso Robles’ $13 million-per-year share of the Nacimiento Water Project, the city will be facing bankruptcy by 2014. At least, that’s what city officials fear, and with a water-rate-increase proposal going out to consumers again, those officials might want to keep their fingers crossed. The city is in the same spot now as it was last year when residents protested a water rate hike. According to city officials and a judicial ruling, residents may not have understood the city’s last notice explaining the proposal, which is why the material is going out again with some slight tweaks. 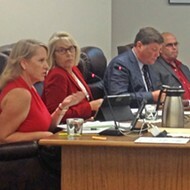 But the vagueness of the first mailer sent to residents resulted in a year’s worth of litigation and expenses that continue to haunt Paso Robles’ finances. While the city has added more information to the new round of notices, the rate plan is the same. If passed, the increased rates will go into effect Jan. 1, 2012. An average homeowner paying a base rate of $18 per month and who uses nine units of water (about average, according to a city rate table) currently would pay $29.88. Under the new rate structure, that same homeowner would pay only a variable rate—no fixed base—and is looking at a bill of $39.60 in 2015. If voters kill the ordinance again, city officials plan to implement a contingency plan and restrictions on water use. Paso Robles Water Resource Manager Christopher Alakel said the city water supply has been designated as a level of severity two, which means the demand for water outweighs the supply by 20 percent. (The unincorporated areas in the county are currently at level three and are entangled in a battle between property owners and government officials seeking to stop excessively draining the basin.) For now, the city’s back-up plan is to conserve. Enter the Nacimiento Water Project, which, in addition to providing water to other cities and towns, is a much-needed piece of infrastructure to alleviate Paso’s water woes. That’s what ex-Paso-Robles-mayor, now SLO County Supervisor Frank Mecham thought when he accepted the bid for the project, anyway. Paying for it, however, is still a problem. In total, the city is facing an annual bill of $13 million a year to pay for cost of water, maintenance, and debt service for the Nacimiento Water Project. Paso Robles owes $60 million for its share of the 45-mile pipeline that stretches from Lake Nacimiento to San Luis Obispo. The project cost $176 million in total. A year ago, city officials nearly had money in hand after adopting a formula for rate increases in April 2010. However, a group identified as Concerned Citizens for Paso Robles sued, claiming the increases were a special tax and therefore violated Proposition 218, which guides how cities take such increases to the public for approval. The city came out on top in court, but was ordered to provide more information if and when it took the rates back to the public. “It was a landmark case,” Alakel said. According to court documents, the first notice failed to provide adequate information explaining the basis for the change. “Stuck on a technicality,” is how Alakel described it, though he admitted information was indeed left off the notices. As of press time, the new and improved notices were hitting mailboxes. If all goes well—as far as the city’s concerned—an ordinance to codify the rate increases will be introduced at a public hearing on April 5. Though there aren’t currently plans to challenge the rates if they’re adopted again, the Concerned Citizens group hopes a concurrent case kicking around the California Supreme Court could make any future litigation unnecessary and perhaps award residents rates they were temporarily charged in 2005, said spokesman John Borst. If utility users want to strike down the rate-increase proposal, they need to mount a majority protest. Even if the rates go through, however, there’s a 30-day window that could undo the process yet again. With enough signatures from registered voters, Paso Roblans could craft a referendum that would at the very least delay the city’s ability to collect money, if not halt it completely. Alakel said the city is “at its greatest risk” during the referendum period. Meanwhile, the city is on course to hack nearly $26 million from its budget, with annual cuts stretching from the 2009-10 fiscal year to 2012-13. On Feb. 15, the City Council approved cuts to city services, which included closing Centennial Pool for a year. 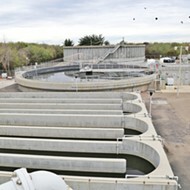 The most recent setbacks pushed construction of a $24 million treatment plant—which the city needs in order to accept Nacimiento water—to 2015. And other bits of Paso Robles infrastructure are in need of repair, like the 21st Street reservoir built in the ’20s. Alakel said he’s worried an earthquake might take out the structure if it’s not renovated soon, a move that will cost more money. For Paso, there are four courses of action that potentially will buy the city time before an inevitable—if not already occurring—water shortage turns into a crisis. According to SLO County Water Resources Engineer Courtney Howard, the four-pronged plan is to improve ground water monitoring, implement water conservation efforts, more strictly control land use, and supplement reserves with water from the Nacimiento pipeline. Meanwhile, concerned residents have banded together to form the Paso Basin Groundwater Advisory Committee. The group’s aim is to craft a groundwater management plan, which includes coordinating educational outreach programs and working to monitor and report water usage. Committee members have tasked themselves with trying to collaborate on the water shortages, balancing vineyard and agricultural with rural residential areas. “Dealing with everybody’s water rights, it’s beyond a political decision at this point,” said Sue Harvey of North County Watch. Intern Anthony Pannone can be reached through Managing Editor Ashley Schwellenbach at aschwellenbach@newtimesslo.com.